Our Women as Empowered Learners and Leaders (WELL) Program is designed to give you the confidence you need to succeed, and help you find your purpose, passion and path to the future. 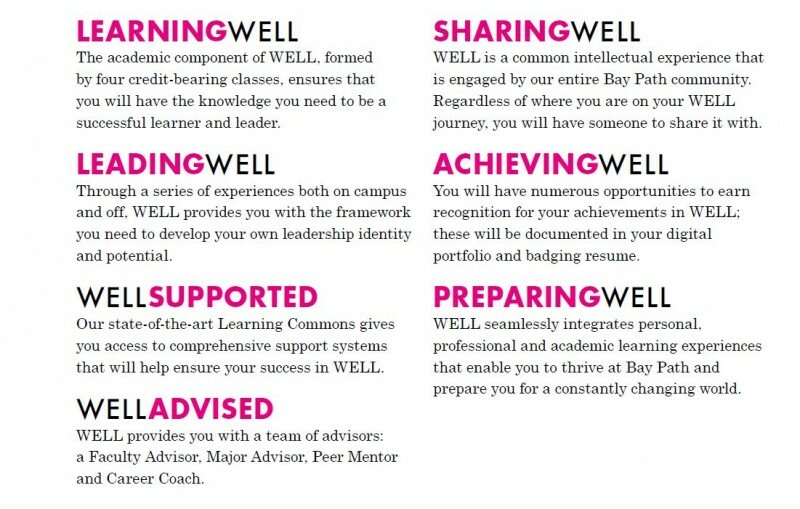 Taught by full-time faculty and staff, there are four courses (10 credits total) that are the building blocks of the WELL program. You will be engaged in self-exploration that will be mapped to educational, career and life planning. Confidence building begins here as you define your personal brand and story, hone your leadership skills, and learn how to effect community-based change. This is where you begin to connect your values with what you want to do: think of it as your passion and your potential. You’ll be introduced to the annual University Theme through the first-year read. The book will also be your springboard in the WEL100 class, where you start to develop your voice and style through discussions and writing. Your peer mentor, an upper-class student who has taken WELL 100, will help you navigate the transition to all aspects of college life, an important first step in gaining confidence. Now you begin to tell your story. Not just in a classroom, but on stage. WEL200 is taught in Bay Path’s Mills Theatre, home for our performing arts events. Your audience is your classmates and now it’s your turn to shine. You’ll be asked key questions such as “How do you present yourself?” “What is your body language?” “How do you relate to your listener?” These are skills you’ll be using in interviewing, networking, and presenting yourself professionally. It’s an essential part of building your confidence. Get ready to launch. Get ready for your career or graduate school. You’ve taken part in job shadowing, mentoring, internships, and practicums—right from the beginning of your time at Bay Path you have been preparing for what happens after Bay Path. 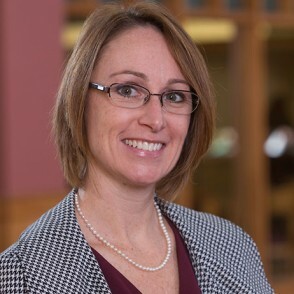 Plan to take WEL310 in your sophomore or junior year prior to your internship or fieldwork, and the Sullivan Career and Life Planning Center (SCLP) will help you take concrete career steps: interviewing, resume building, LinkedIn profile, and a portable e-portfolio that represents who you are and what you’ve done. Throughout the course, you’ll be receiving feedback not just from the SCLP staff, but professionals in your prospective field. From lawyers to accountants to counselors, your connection will be strengthened. The WELL program has been building to this moment--you’ll start to own your confidence and your convictions. By WEL400, you will be ready to blend all the skills you have learned during the WELL program—leadership, critical thinking, research, writing, analysis, and public presentation—with a community service project. Empathy, respect, and tolerance are the core human values that are stressed. It’s what every good leader needs to confidently show the way. Through experiences that are woven into the classroom and community projects, you will be guided to develop your own definition of what is a leader, and what is your leadership style. Role models are important, too, and you’ll been able to attend Bay Path’s annual Women’s Leadership Conference (WLC) and listen to the stories of remarkable women leaders as Queen Latifah, Barbara Walters, Gloria Estefan, Soledad O’Brien, and Maya Angelou. Beginning in WEL100, you’ll create a digital portfolio that will document your growth as a learner and a leader. Think of it as a digital diary that will hold your research papers, reflections on job shadowing or internships, awards and recognitions, as well as photos and videos. By WEL400, your digital portfolio will be an album of your accomplishments that can be tailored to meet your particular career and educational needs. When you graduate with diploma in hand, your digital portfolio will be also be proof of all you have achieved at Bay Path. Through the state-of-the-art Learning Commons, academic support is available for all students in all courses at all times. You’ll also have access to a wide range of academic writing, learning, and study strategies through the assistance of peer tutors, workshops, and special sessions. Our goal is to provide you with resources and tools for academic success. As an incoming student, you will be given an iPad that will be your personal study partner. Your professor will be tracking how and what you learn through the iPad—ready to give you the right assistance and develop a plan that fits your style of learning.